Home » Blog » Furniture Shopping Tips: Designers’ Secrets! Furniture Shopping Tips: Designers’ Secrets! Seeing your options spread out in your space will help with decision making (it will also put your mind at ease when trying to visualize how this custom piece will look once it gets delivered). Furniture shopping can be a daunting task, especially if you’re starting from scratch. Whether you have just purchased your first home, are moving to a bigger home and need additional pieces, or are just looking for one piece of furniture in particular, it can be a big deal. I’ve come up with a few key pieces of advice (designer tips and tricks!) to help you guys during this furniture shopping process. Measure it out. If you see a piece you love in the store, you want to make sure it’s the right size for the space in which you are envisioning it. Take some quick measurements of the piece. You can always ask one of the sales associates or designers for help, we never mind measuring things for you and we’ll normally send you home with a free BW tape measurement as an added bonus! When you get home, grab some blue painters tape and map out the piece of furniture in your home, marking where the furniture will be by placing the tape on the floor. Double checking that the piece will fit is always a good idea and will make your feel more confident when making an investment purchase. Please please please, don’t be too matchy matchy. 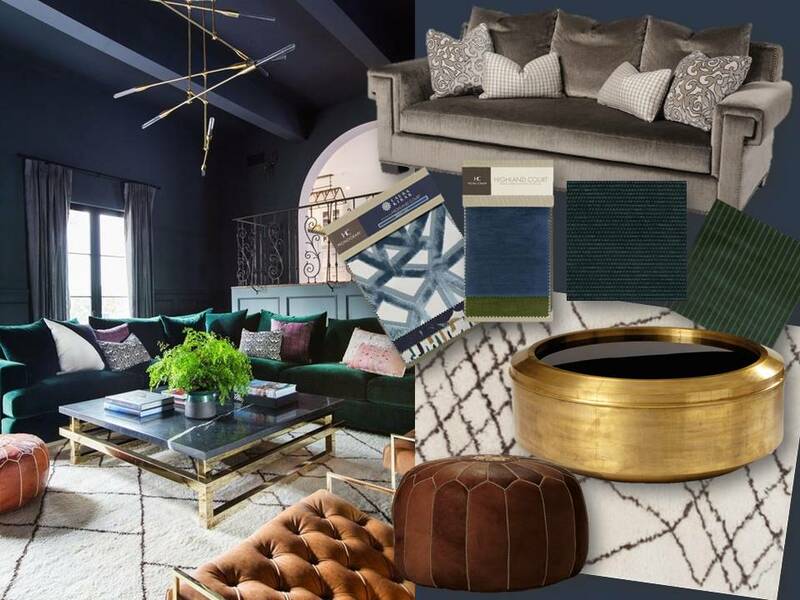 Having your furniture pieces be cohesive and create a complimentary over all look is always a high priority, BUT that does not mean that every piece has to match. Lots of times people think that having all your pieces match is a safe move, but it can actually come across as really overwhelming. It’s more important to find pieces that balance each other out. Pair your simple, modern sofa with a more glam and interesting cocktail table. Opposites DO attract! Sample swatches will save your life. Lots of places, Barry Wooley Designs included, have endless amounts of fabric samples. If you’re spending the money to order a custom piece of upholstered furniture, you want to make sure you’re using the perfect fabric. We’ll always let you take some samples home to see how they look in your own home’s natural lighting. One fabric could look completely different at your house than it does in your living room. Seeing your options spread out in your space will help with decision making (it will also put your mind at ease when trying to visualize how this custom piece will look once it gets delivered). If you’re going to be spending a good amount of money on a custom piece, we want it to look PERFECT. Need a second opinion? Don’t be shy to ask us to come out for a consult! Save your rug shopping for in person. Rugs are super important for the overall look of your room. They can anchor all your furniture and provide the perfect back drop for your pretty furniture pieces to pop! However, no one wants to order a rug online that they think is going to be a bright vibrant red and have it show up as a muted pink. It’s a safer bet to see a rug in person before purchasing. This allows you to touch and feel the rug, you’ll get to check out the fiber content and the pile and see if it’s really what you want. One of the amazing things about our showroom is that we have lots of in-stock rugs that you can take home that day OR you can browse through our rug samples and just order the perfect one. If you think you’re a “picky purchaser” (it’s okay, we all are), you can look through the endless options in our catalogs and we can order in a sample of your favorite pick. We understand the importance of the perfect rug, so we go the extra mile to help you find it!